Discover a cream-y classic. Enjoy this modern take on the original. PREP: 15 min. plus freezing. 1. LINE 9×5-inch loaf pan with foil. 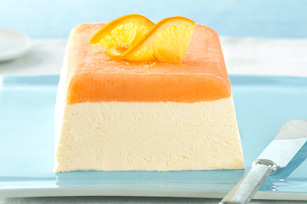 Spread sherbet onto bottom of prepared pan to form even layer. Freeze 10 min. 2. MEANWHILE, beat cream cheese in large bowl with mixer until creamy. Gradually add condensed milk and juice, beating until blended. Gently stir in Cool Whip. Pour over sherbet in pan. 3. FREEZE 3 hours. To unmold, invert pan onto plate; remove foil. Healthy Living: Trim 30 calories and 3 grams of fat per serving by preparing with Philadelphia Neufchatel Cheese and Cool Whip Lite Whipped Topping.